Fizzy, lively, low-stakes and soundtracked by ABBA, ‘Mamma Mia 2’ feels and sounds like a summer vacation. This is a movie that very much requires you to be in the “right mood.” Three stars out of four. “Mamma Mia! Here We Go Again” is a wholly ridiculous movie that I thoroughly enjoyed. It’s the kind of movie that feels and sounds like a summer vacation should: Fizzy, lively, low-stakes and soundtracked by ABBA. This is a world where things generally just work out, where folks are kind and willing to help, where everyone has perfect beach hair, where characters just (asterisk)know(asterisk) they’re pregnant after one bout of morning sickness, and where old flings and family members are not only welcome to suddenly sail back into lives they’ve abandoned but greeted with joy and a song. Who’s got time for bitterness and jealousy in these Greek isles? The dialogue may be ridiculous, the plot may be questionable, and the musical numbers may be staged and stitched together like a manic fever dream (including a uniquely crazy rendition of “Waterloo” with Lily James and Hugh Skinner prancing around a French restaurant). But “Mamma Mia 2″ wears its happy heart so earnestly on its fringed suede sleeve that it almost doesn’t matter. Like an all-inclusive resort, it might be a little cheesy and there is surely some cooler and more authentic option out there with less green screen and more character development, but easy can be its own kind of fun. And this all-inclusive resort has Cher. And Andy Garcia. And Colin Firth playing Leonardo DiCaprio to Stellan Skarsgard’s Kate Winslet at the bow of a boat packed to the gills with a mass of people singing “Dancing Queen.” And minimal singing from Pierce Brosnan. And a final show-stopper that’s so fun, you might be disappointed there isn’t an encore. But the real reason this bonkers movie works so well is the incandescent Lily James. She plays a younger Donna (who 40 years later is played by Meryl Streep), during a very eventful summer in 1979 where she both finds her calling and meets (and sleeps with) the three men who all could very possibly be the father of her daughter, Sophie (Amanda Seyfried). It should be said that two of the three suitors are uncomfortably overeager to get Donna into bed as soon as they meet her. 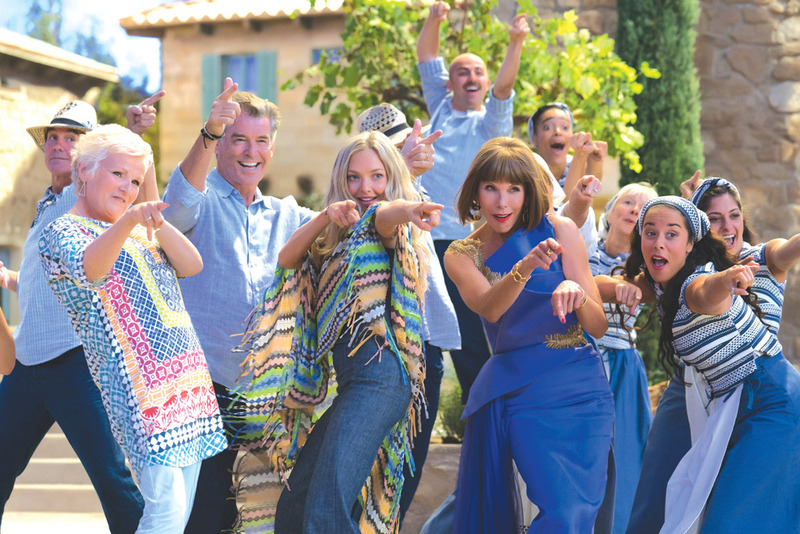 (L to R, center) Rosie (JULIE WALTERS), Sam (PIERCE BROSNAN), Sophie (AMANDA SEYFRIED) and Tanya (CHRISTINE BARANSKI) in “Mamma Mia! Here We Go Again.” Ten years after “Mamma Mia! The Movie,” you are invited to return to the magical Greek island of Kalokairi in an all-new original musical based on the songs of ABBA. The flashback portions are told in tandem with what’s happening in the present day, where Sophie is preparing for the grand opening of the hotel Donna. Seyfried is good, if underserved, and her story picks up considerably when Tanya (Christine Baranski) and Rosie (Julie Walters) arrive, but it’s the ’79 portion that you want to keep going back to (at least until Cher shows up for the last 10 minutes). James, who is always strong no matter how big her role (from “Cinderella” to “The Darkest Hour”), gets a real star turn here. She also has a sweetly appealing voice that’s (thankfully) more 90s Disney than modern folk singer. And with some more talented singers in her male counterparts, young Bill (Josh Dylan), Harry (Hugh Skinner) and Sam (Jeremy Irvine), you find yourself actually looking forward to their songs instead of bracing for them. Jessica Keenan Wynn and Alexa Davies also shine as young Tanya and Rosie, although I would like a word with whoever decided that they would have the exact same haircuts 40 years earlier. And perhaps the most surprising thing about this whole sequined bell-bottomed experience is you might even find yourself getting a little emotional. But not too much, this is vacation after all. “Mamma Mia! Here We Go Again,” a Universal Pictures release, is rated PG-13 by the Motion Picture Association of America for “for some suggestive material.” Running time: 114 minutes. Three stars out of four.